Good news for BEACON and our Multi-Criterion Decision Making team (BEACON faculty Kalyan Deb, Erik Goodman, and BEACON collaborator Dr. Oliver Chikumbo, of Scion, a New Zealand Crown Research Institute). In January, the team submitted a paper for the prestigious Wiley Practice Prize competition, held every 2 years at the Multi-Criteria Decision Making Conference. 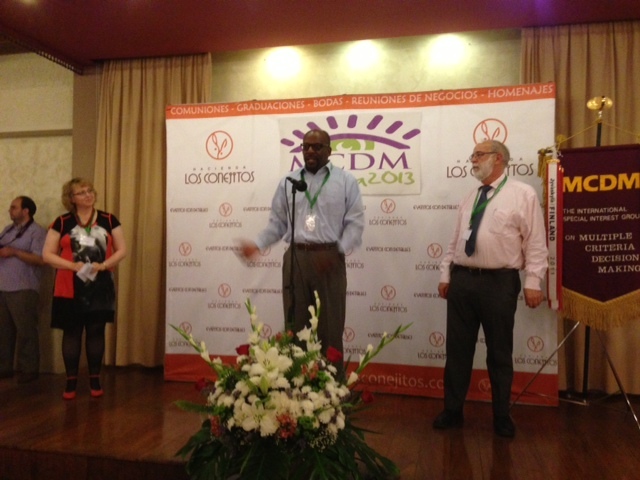 This year’s MCDM Conference was in Málaga, Spain, June 17-21. Dr. Chikumbo accepting the Prize. The team’s paper had been selected as one of four finalists for presentation at the Conference, and was presented by Dr. Chikumbo, with Prof. Deb also in attendance. The team learned yesterday, June 20, that they had been awarded the Wiley Practice Prize for 2013. The work has been conducted by Chikumbo, Deb and Goodman over the last two years, under BEACON sponsorship, with Dr. Chikumbo having spent one month in 2011 and one month in 2013 as a BEACON visitor. The project arose from earlier collaborations between Goodman and Chikumbo beginning in the 1990’s and continuing at a low level ever since. The work is continuing, and the team has been joined by Daniel Couvertier, a BEACON graduate student in CSE at MSU, and Mr. Hyungon Kim, a graduate student in the Human Interface Technology Lab at the University of Canterbury (New Zealand), supervised by Prof. Gun Lee. The project depends heavily on being able to optimize a 14-objective problem, determining a Pareto set of optimal tradeoff solutions. The Evolutionary Multi-Objective Optimization (EMOO) search technology developed by the team complemented Prof. Deb’s R-NSGA-II algorithm with new epigenetic operators developed by the team and to be further studied by Daniel Couvertier. The size of the search space of potential solutions is on the order of 10**600, and with 14 objectives to evaluate, appears at first glance to defy any efforts at optimization. However, the combination of heuristics and decision-making processes used by the team (nicknamed “WISDOM”) was able to find a useful Pareto set of solutions that bore up well under critical examination. The team is also working with the University of Canterbury (in New Zealand) to develop virtual reality tools to help users comprehend the set of Pareto-optimal solutions. The decision-making approach given a set of optimal solutions involves allowing individual stakeholders to first express their relative preferences among the 14 objectives, and then to rank four solutions (selected according to their preferences from among the optimal set). These ranks are then combined using a scheme called the Analytical Hierarchy Process (AHP) to identify the solution most compatible with the preferences of all stakeholders. The WISDOM process is applicable to many “wicked” societal problems, and allows stakeholders to address simultaneously economic, environmental and social concerns, to satisfy the “Triple Bottom Line.” The team plans to redevelop the platform for integrating the many distinct simulators used to calculate the 14 objective values for each solution into a sophisticated sensor and model integration framework in order to make it easier to generalize the approach for application to many problem domains, in partnership with a company with which negotiations are currently underway. This project is a wonderful example of evolution’s practical value outside of the biological lab. For more information about the project, check out BEACON’s “International” project pages.